Beats on chest, scratches backside, occasionally adjusts glasses. Rarely enrages, grows larger with glowing eyes and fists. Rarely throws down a small force field and holds an electric device. This pet is a free gift for purchasing Overwatch Origins or the Collector's Edition of Overwatch. Zaps an enemy, dealing 433 Mechanical damage. Assault the enemy with infallible logic, dealing 453 Humanoid damage. On the next round, you attack, dealing 591 Humanoid damage. So. Just got him today and oh my mercifull Pete. HE IS THE MOST PERFECT THING I have ever seen. Winston I will love you forever and ever. His barrier (which looks absolutely amazing) even blocks the damage inflicted on himself when using his Body Slam. Most adorable pet ever. And while not as overly powerful as the last cross-over pet (Graves), he can still hold his own. When idle, he'll pound his chest as any other ape, but he'll also use his primal rage and get all electric. Rarely do I rave about a pet but Baby Winston is just so adorable I want to reach through the screen and hug him. His animations are cute, he looks like a little brainiac, and he's a pretty decent little fighter. If I never play Overwatch he was still worth every penny I spent on the game. I take it winston doesn't come out till the game does? So...is anyone besides me gonna buy Overwatch just for Winston? I have zero interest in the game, and my hubby is in the beta. Just not my style. But...gotta have the pet. 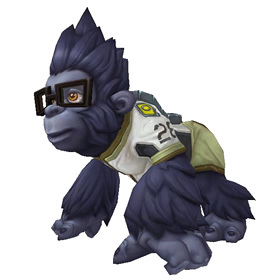 I mean, really....nerd gorilla! It's priceless! I wish I could get this little buddy but I won't even be able to play Overwatch as the beta gave me motion sickness. Will have to just move this most awesome looking pet into Exclude and not look at it haha. Barrier Projector blocks ALL DAMAGE* to EVERY pet for 2 rounds. Any poisons, Dots, bone storms, bleeds, or Cyclones will be absorbed. *All but damage above 237. This one ability basically negates most multi hit pet strategies while BW pounds on the other team. An intelligent ape that claims he is from 'the moon'. Does he mean the White Lady, or the Blue Child?